While Brian is busy in the kitchen in Buka, I am busy with another STEP course. This is the third module, and 19 students and 7 national mentors have returned to learn more about tok ples (vernacular) literacy. During STEP, I leave the house before 7:30 to walk out to the training center – a 20-minute walk from my house. I walk home again for lunch, and then back out again for another few hours in the afternoons. I always know that during STEP I will get plenty of exercise! In these pictures the students are practicing their writing fluency. Fluency lessons are an important part of the course. 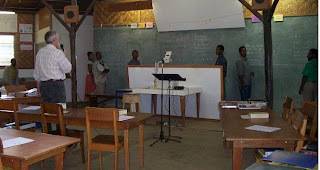 These men and women will be examples for others in their communities, and so it is important that they are able to read and write their own language fluently. 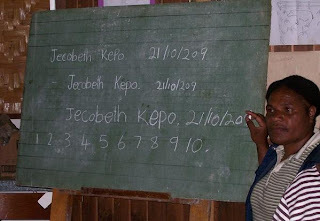 In this lesson, they are getting good practice at writing their names and the date clearly on the chalkboard.